Kommt zur SEEBRÜCKE-Demo am 13.10. | 14 Uhr | Martin-Luther-Platz! Bitte bringt Transpis, Plakate und orange Kleidung mit. Die Farbe Orange sowie Warn- und Rettungswesten sind ein gemeinsames Erkennungszeichen der SEEBRÜCKE-Bewegung. Das Zeigen von National- und Parteiflaggen ist nicht erwünscht. SEEBRÜCKE-Demonstration on October 13th at 2pm at Martin-Luther-Platz in Erlangen! This year more than 1500 people have already died during the dangerous crossing in the Mediterranean Sea. At the same time, sea rescue is being criminalized and prosecuted. Sea rescue boats are prevented from continuing their journey or denied mooring in ports that are safe. But migration is not a crime! Migration is and has always been part of our society! 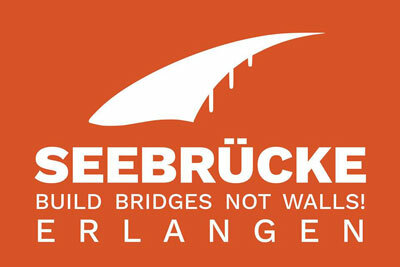 The SEEBRÜCKE is an international movement, supported by various civil society alliances and people. Also in Erlangen we declare our solidarity with all people who are forced to flee their homes. We demand to stop the criminalisation of sea rescue, we demand the establishment of safe routes for refugees and we demand safe places to arrive and stay in Europe, in Germany and also in Erlangen. Our protest is also directed against the EU’s and the Federal Government’s policy, against Fortress Europe, which lets people drown in the Mediterranean Sea and accepts the death of people. We demand safety for all, an open, humanitarian Europe, cities based on solidarity and safe harbours. We want Erlangen to be an open and solidarity-based city for all! Please bring transpis, posters and orange clothes. The colour orange as well as warning and life jackets are a common sign of the SEEBRÜCKE movement. The showing of national and party flags is not permitted. See you there!